Is it bad to not enjoy playing with your kids? Sometimes the answer is no because i actually hate playing cars. Playing cars involves pushing said cars around the room going ‘brrrrrm brrrrrm’ and occasionally crashing into things. 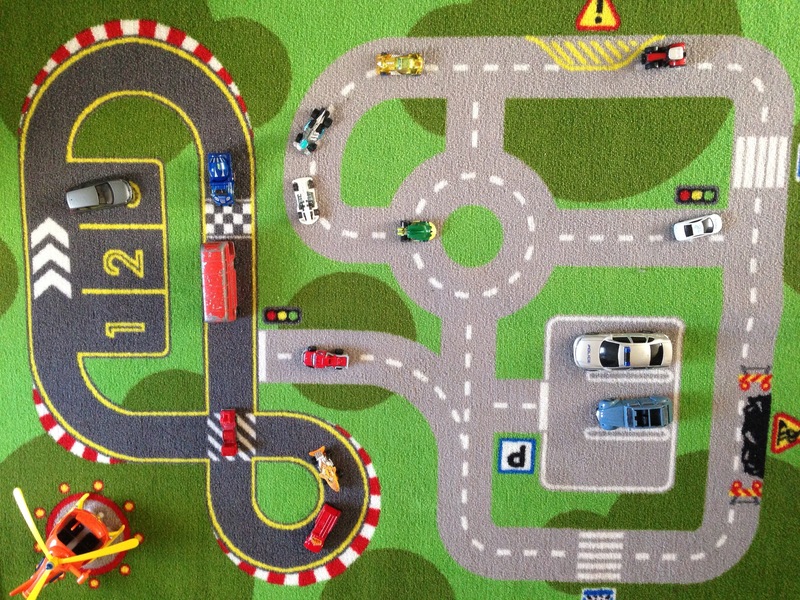 Playing cars is very fun to my just turned 3 year old – playing cars is mind numbingly dull to me. Don’t get me wrong i do play cars, i have to. It is impossible to skilfully deflect the question 24/7 but after about 2 minutes i get bored and try to escape. When this is met by disapproval i ask ‘Can you play cars on your own for a minute?’ and big blue puppy dog eyes look back at me and a whimpering little voice says ‘But i don’t want to play all on my own’. 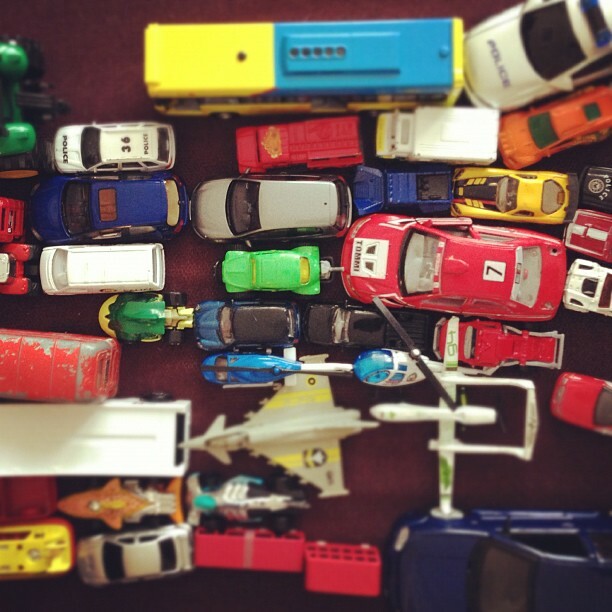 playing car parks – arranging cars into a big congested car park. The is slightly better than the original game, slightly. So I feel bad. Does anyone else feel like this, am i a terrible mother for not enjoying playing games with my child? Should i just grit my teeth and play cars until i end up completely loopy? Is my excuse that i am encouraging his independence a load of tosh? *Caveat – i do like to do jigsaws, crafts, lego and baking so i am not an entirely evil mum. This entry was posted in Parenting on August 20, 2013 by Katie. Feel exactly the same. I’m hopeless at imagination games. I don’t care what happening to the dinosaur and playing cars is very dull. Makes me feel bad because surely I should be treasuring these previous moments rather than calculating if I’ve played long enough to escape yet. Exactly – feels bad but hopefully it’s pretty normal?! I found the last heat magazine I bought the other day.. It was dated 24th Feb 2012. The next day I gave birth! Cars are boring! I lie on the floor and let Sebastian drive on me… It’s half like a relaxing massage half being bashed in the head! Ahh that’s a good idea i might try that one, do you think you do that with Heat magazine too? More than once I’ve hidden a toy or book du jour under the couch so I wouldn’t have to play or read it one more time that day. I can only do the magic mermaid voice or read Green Eggs and freaking Ham so many times before I want to chew my own tongue off. Ha ha. I’m ashamed to say i’ve hidden toys too – terrible really. I hope it’s not bad because I do the same thing! I try to get my kids to play spa. This requires them to massage my hands and feet and style my hair…all while laying down of course. I even pay for the services, they think it’s great! Oh not at all! I’m the same. My daughter loves playing cars too and trains (she’s a big fan of Thomas). She also loves playing with her doll’s house. That also bores me. Thank goodness she’s easily distracted. I usually say “How about colouring instead? Or play dough, anything but cars. It’s my husband who really is so good at playing with her. They use all her toys to go on “expeditions” etc… As for her mum? I’m boring. Oh good glad it’s not just me! I use the distraction technique often too and it’s probably why we spend so much time out of the house. I’d much rather go to the beach or park than push cars about. Your so lucky! I so look forward to the day when my two are old enough to play together and leave me out of it! I’d take it as a good chance to lie down (albeit on the floor!) and close my eyes! I feel your pain, my little girl is older now but when she was little the endless can you play this and can you play that was just enough for me to want to go and hide in the bathroom haha! Now she’s older though its ‘Mummy, come and play schools’ ‘Mummy!!!! Come play teenagers with meeee’ I do play but half the time I don’t want to, pretending to talk on the phone to my imaginary teenage friend is enough to make me go crazy!